How Do You Spell CURSES? Correct spelling for the English word "curses" is [k_ˈɜː_s_ɪ_z], [kˈɜːsɪz], [kˈɜːsɪz]] (IPA phonetic alphabet). 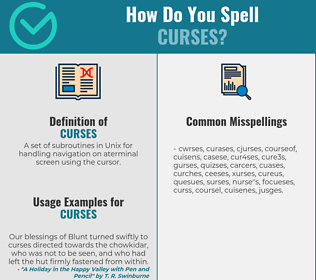 Below is the list of 346 misspellings for the word "curses". A set of subroutines in Unix for handling navigation on aterminal screen using the cursor.